Facebook lead ads allow potential customers to sign up for your offers and give you accurate contact information for follow up. 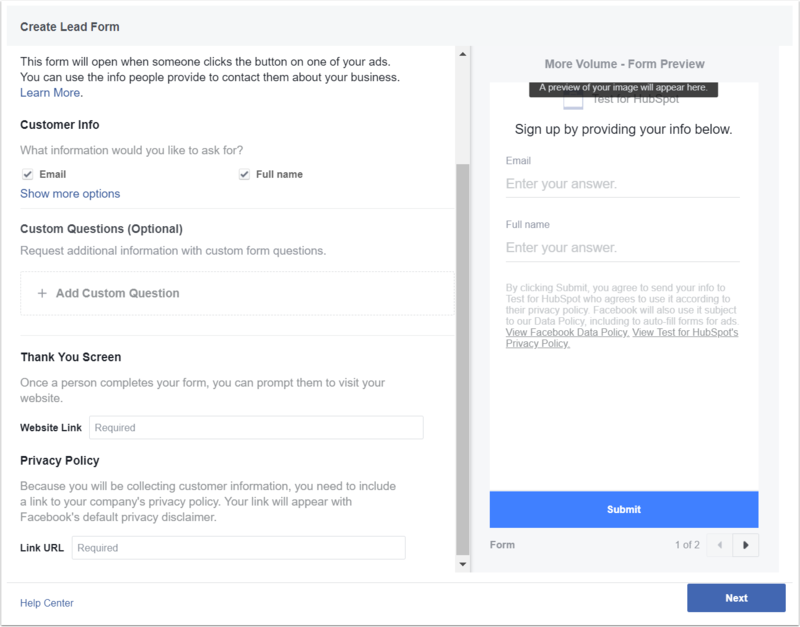 When someone clicks your lead ad, they'll see a form that’s auto-filled with information they’ve shared with Facebook, like their name, number, and/or email. After connecting your Facebook Ads account to HubSpot, you can create Facebook lead ads through the HubSpot ads tool. In the upper right, click Create ad campaign downCarat, then select Facebook lead ad. Enter a Campaign name, then click Next. In the dialog box, click the dropdown menu and select the Facebook page to link to HubSpot. Then, click Continue. Click the Form language dropdown menu to select a form language. Select which information to ask for on your form. By default, Email and Full name will be selected. Click Show more options to select additional fields. Enter a Website link to link visitors to your website after submitting your form. In the Ad Creative section, set the format, headline, text, image, and call-to-action for your lead ad. In the Audience section, select the visitors to target. Select an existing audience, or click Create new audience to set up a new target audience. Set your Daily Budget. The actual amount spent daily may vary, as determined by Facebook based on the opportunities for results each day. A minimum of $5.00 is recommended. Review the Estimated People Reached to see how many people you can expect to reach based on your selected audience and budget. Set a duration for your ad. Select a default duration option, or click the Run this ad until date picker to set a custom duration. Review the total price of your ad in the text box. Under Payment, select the currency to be charged. Your budget and total price will be updated to reflect changes made to the currency. In the bottom right, click Promote. In the dialog box, click I Agree to Terms and Conditions. 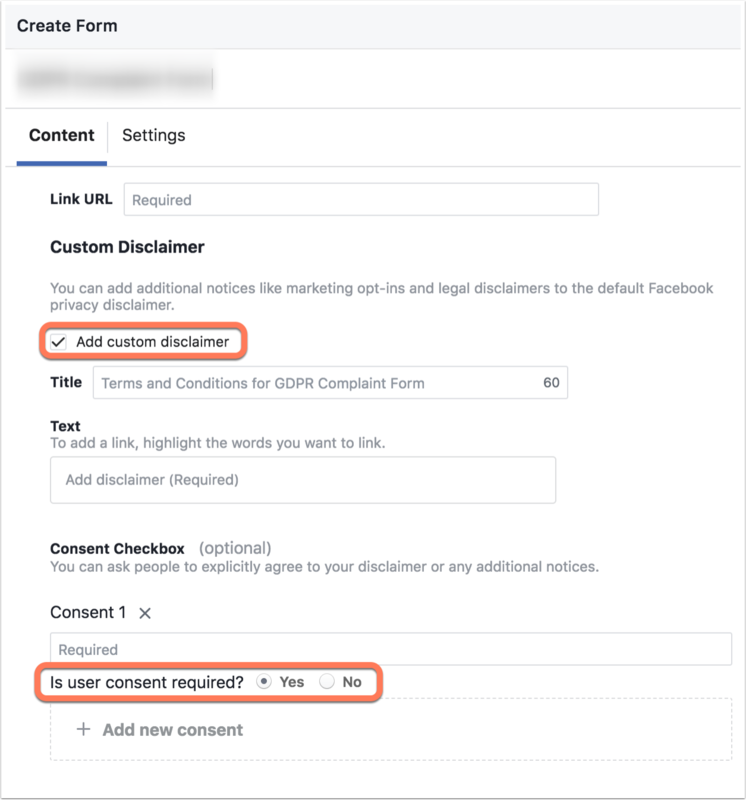 You can add a consent field to your Facebook lead ads. Any consent fields from your Facebook lead ads will sync over to HubSpot as a new contact property. These properties will be labeled with FB Consent before the property name. These properties can be used to create a list of contacts who have given you consent to be contacted via a Facebook lead ad. Please note: you can only add a custom disclaimer when creating a lead ad in Facebook. Select the Add custom disclaimer checkbox, then enter a Title and disclaimer Text. For Is user consent required?, select Yes. Once the consent field is added, it will start syncing for all lead ad forms in HubSpot. If you created a lead ad before adding the consent field which is already syncing with HubSpot, any new leads that come in the lead ad will sync the consent field to HubSpot. Any leads that were created before the consent field was added to your lead ads will not sync the consent field to HubSpot. Click the Receive a notification whenever you get a new contact dropdown menu and select user(s) to notify when a new contact is created through the lead ad. To add new lead ad contacts to a new active list (Marketing Hub Starter, Basic, Professional, and Enterprise only), enter the name of your new list in the Create list of lead ad contacts field. To customize any further automation, click create a workflow to create a workflow with an enrollment trigger of the lead ad form submission (Marketing Hub Professional and Enterprise only). Once you've set up your automation, click Done. Next, learn how to analyze your ad campaigns.